What does it mean to be “off the grid”? A bit more than a week ago, Matt and I watched the final episode of Sarah Richardson’s latest show, Sarah Off The Grid. 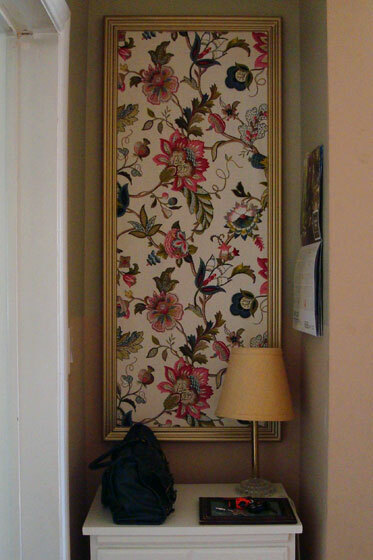 For those that don’t know, Sarah Richardson is a popular Canadian TV personality and designer. She does beautiful work, and I was excited to see a new show from her. I was particularly excited because this series was all about her and her family building an “off-grid” house. The shows were mostly focused on decorating–that’s what Sarah’s known for mostly and I of course enjoyed seeing the beautiful spaces she created. I was a bit disappointed that they didn’t share a lot of details on the off grid portion. 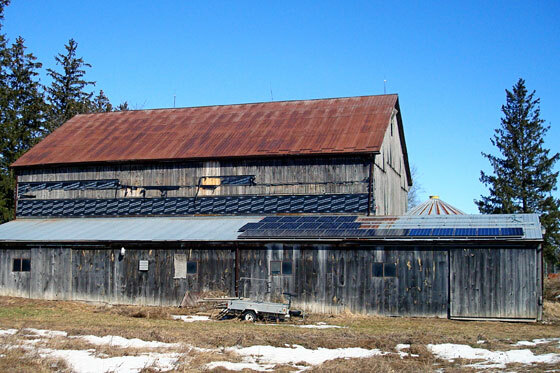 In fact, I couldn’t find any photos of the barn with its solar array to include in this post (all photos are from HGTV). What they did feature made me think about what it means to be off the grid. 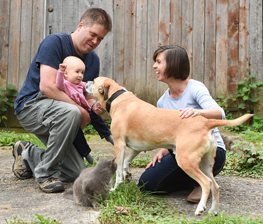 For Sarah and her family, they were focused on being off the hydro grid. 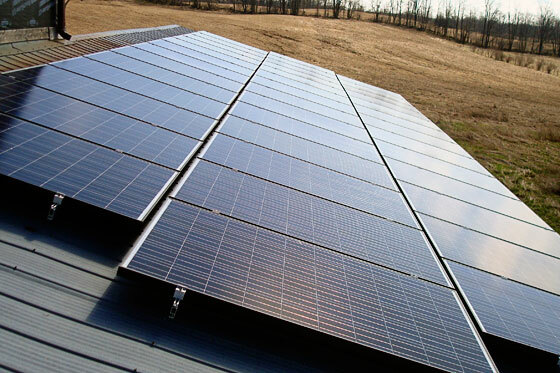 A large array of solar panels provides all of the power needed. Woodstoves and fireplaces supplement a heating system that runs on propane. They installed a well and septic system (drilling the well took a few tries as they had trouble finding enough water, and there was discussion of adding a cistern, but I’m not clear if they had to do that as well). For me, when I think of off the grid, I tend to go all the way to self-sufficiency. In particular, avoiding fossil fuels. So I was a bit disappointed to see Sarah’s crew installing a giant propane tank. I love at our farm that we generate power through our solar panels, we have no need for propane or oil thanks to our geothermal system, and our well and septic handle all of our water needs. We could be self-sufficient. We’re not self-sufficient because our solar panels are not off grid. They feed back into the grid, and we’re paid for the power we generate. We then draw the power we need for the house from the grid. Usage and production are completely separate. Batteries, and potentially more panels, would be needed if we wanted to disconnect from the provincial hydro system entirely (like Sarah was able to do). I’m not sure why Sarah elected not to do geothermal. Perhaps the (small) amount of power required to run the system was too much for their solar panels, which also had to run the rest of the house. Perhaps it was a budget consideration. Perhaps the system required for her (giant) 5,000 square foot house would have been too difficult to set up. They did take a number of steps to ensure their house is as energy efficient as possible from insulation to lighting to windows. Sarah’s husband Alex shares some of his tips in this video. I was glad to see environmental impact considered throughout the build and the show. That’s a message I don’t often hear on other shows. I wish they had focused on it even more and explained more of their thought process about what off the grid means to them. Tim at Design Maze posted recaps of each episode, including more beautiful photos. 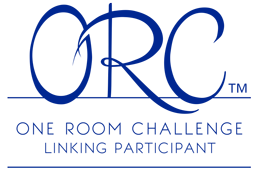 What does off the grid mean to you? How are you minimizing your home’s impact on the environment? Did you watch Sarah Off The Grid? What did you think of the show? Forty solar panels. Three years. $0.396 per kWh. Grand total so far? $12,614.13. It’s been three years since we turned on our solar panels. As I’ve done for the last two years, I’m looking back at how much income we have generated. Here’s the summary from our first year and from last year. As a reminder, we’re part of Ontario’s microFIT program. Under this program, we installed solar panels, and then the power that we generate goes back into the provincial grid. We have a 20-year contract where the province pays us $0.396/kWh. You can read about the whole saga of Going Solar here. The grand total that we made on our solar panels last year was $4,519.09–close to the previous year’s $4,473.91 but up just a little. Here’s the comparison over the last three years. After a dismal January–seriously, in the whole month we had less than 50 hours of sunlight–things started to brighten up. We even had a few days of double digit income in February, which is a very good day in the winter. Beyond looking at the income we generate on its own, the other check I like to do every year is comparing the income we’ve generated to what we’ve spent on hydro. This year, we came out ahead by $828.06. It is such a nice feeling to know that our electrical bills are essentially covered. The solar panels were a big investment three years ago. We’re still looking at about 6 more years before we’ve generated as much revenue as we put out for the panels and the install. However, we’re a third of the way in both time and money, so we’re right on track. 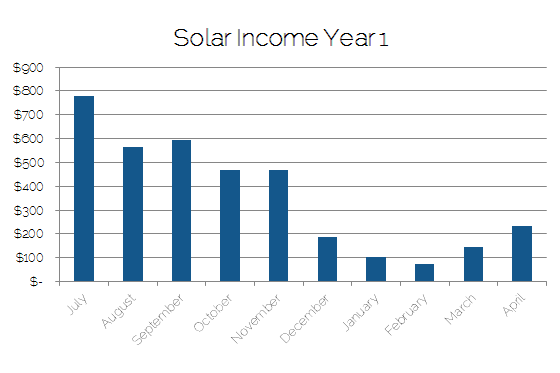 Also, our motivation in going solar is not solely financial. As nice as the money is, it’s equally as nice to feel like we’re making smart choices for the environment, for the future and for our little corner of the world. Two years ago we flipped the switch on our solar panels. It’s hard to believe we’ve had them that long. They’re still a bit of a novelty for us, and we check often to see how much power we’re generating. Last year, I took a look back at our first year, remembering some of the highs and lows, and calculating how much we’d made and how long it would be until we’d made as much money as we invested in the panels. I’ve been waiting to do the same thing again and see what progress we’ve made. Last year, my calculations were only based on part of the year. While the panels were live as of the end of April, we didn’t receive our first cheque from the hydro company until July. This year is the first time we have a full 12 months of payments. Just in case you’re new to our solar saga or don’t remember all the details, we’re part of Ontario’s microFIT program. Under this program, we install solar panels, and then the power that we generate goes back into the provincial grid. 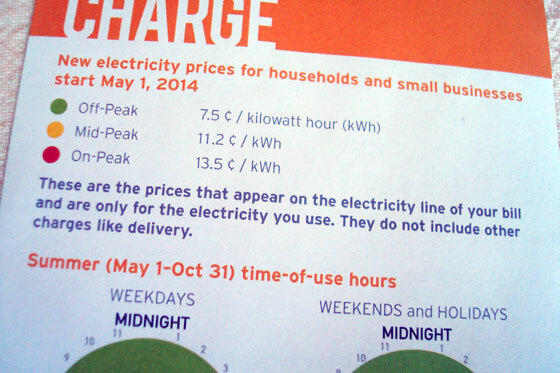 The province pays us $0.396/kWh. You can read about the whole saga of Going Solar here. But now onto this year’s report. 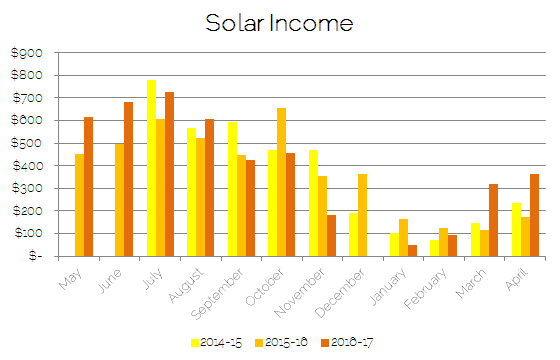 The grand total that we made on the solar panels last year was $4,473.91–up just a bit more than $850 over the year before. So what does this look like? Something like this. The golden yellow is this year and bright yellow is last year. We had a better fall and winter this year compared to last year. Everybody knows it was a much milder winter, but it was also sunnier. I was often amazed when Matt told me at the end of the day how much we’d made. When the sun’s in the southern hemisphere, it sometimes doesn’t matter how bright it gets during the day. The angle of the sun is just so bad that there’s no way our panels produce at their max. But even in the depths of winter we had days where we were making double digits, which was a huge win. The other huge win this year was finally getting our HST refund. This is the 13% sales tax we pay in Ontario on pretty much everything–including the labour and materials to install our panels. Because we run the solar almost like our own small business, we’re able to claim a portion of the tax–in the amount of more than $4,000. Our other big numbers were finally setting a new daily record when we finally broke the $28 mark and making $831 more than we spent on electricity for the whole year. 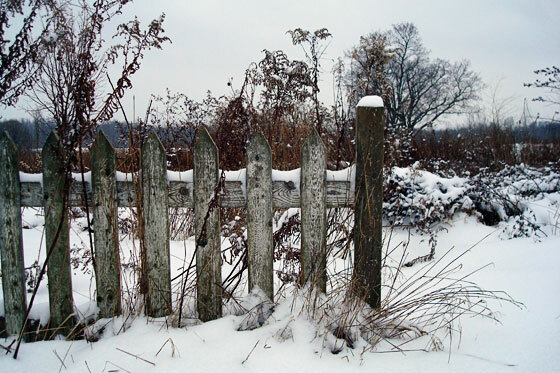 Because it was such a mild winter, we didn’t have any issues with snow on the panels like we did last year. Even the ice storm wasn’t a big deal. In fact, now that we have them, we really don’t have to do anything–except count the deposits to our bank account. Last year, I estimated that it would take about 9 years and 4 months before our income equaled the investment we made in the panels. When the panels were first installed, I thought 8 1/2 years was a realistic estimate. Using this year’s numbers, the payback period would be just over 9 years. This is definitely a long term investment, but the money is only part of the equation for me. I really feel alternative energies like solar are something we need more in the world. And I feel like I have a personal responsibility to support these alternatives as I can. At the farm, we rely on our own well for water and our septic for sewage, we have geothermal for heat and air conditioning, and we generate power for the grid through these solar panels. Plus we’re preserving 129 acres, doing our best to be responsible stewards of our own little chunk of the earth. A year ago, we flipped the switch on our solar panels and started generating electricity. I thought it might be neat to take a look back at the past year and see how our little generating station worked out. If you want to catch up, here are all of the previous posts about Going Solar. Just a reminder, we’re part of Ontario’s microFIT program. Under this program, we install solar panels, and then the power that we generate goes back into the provincial grid. The province pays us $0.396/kWh. Over the past year (10 months actually, since our first payment didn’t arrive until July), we made $3,621.13. Each month the hydro company pays us for the electricity we generated two months before. Just for comparison, we spent $2,604.35 on electricity for the same time period (including the wee bit of power it takes to run the panels). That’s a profit of just over $1,000. Yay to coming out ahead! 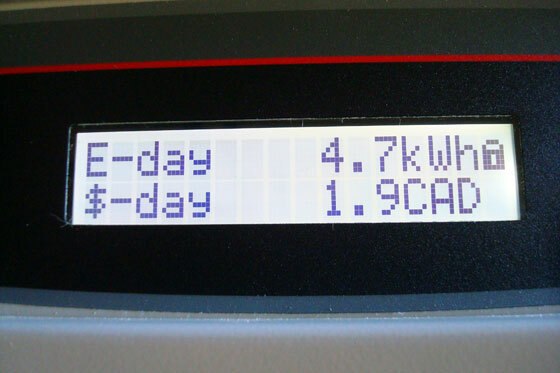 Our inverters tell us roughly how much we make each day. So far, our record is just over $29. Matt so badly wants to break $30. When the panels were first installed, I estimated it would take 8 1/2 years before our income equaled the investment we made in the panels. Using the numbers from the past 10 months, it looks like the payback period is about 9 years and 4 months. I’m optimistic that spring is going to be a good generating time for us, though, so I think the 8 1/2 is still achievable. The winter was pretty dismal. There were lots of days where the income was in the single digits. The sun being in the wrong hemisphere was the biggest problem, but then there was the snow. Snow on the panels drove Matt crazy. 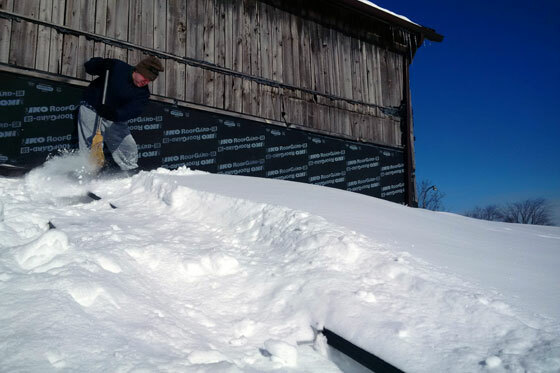 After a couple of big storms, he climbed up on the barn roof with a broom and very gently cleared the panels. The solar array is pretty big though, and Matt’s arms are only so long. There was one hard-packed drift that he just couldn’t reach. This thing was his nemesis. 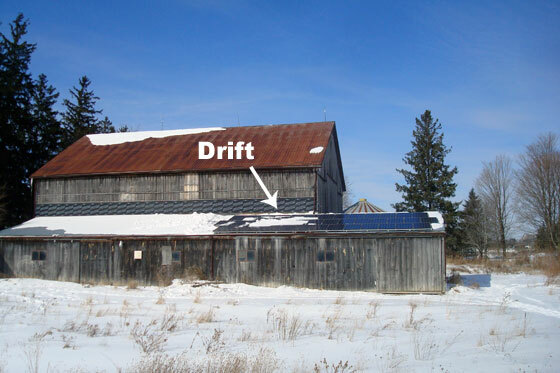 Eventually, with some yoga-like contortions and gentle shovel work from Matt, combined with the help of–what else?–the sun, the drift slid down the panels and off the roof in big icy sheets. Once we hit February, we started having lots of sunny days. As the sun returns to the northern hemisphere, our output has been climbing every day. Even cloudy days result in double digits. Beyond the snow, we’ve had no issues at all. The inverters and the panels all are chugging along, the money is trickling in, and we’re doing our part to generate some clean power. We’re really happy with our decision to install the solar panels. It’s time for the final post in our solar panel saga. As we all know, going green costs green. Today, I’m going into the numbers (in a slightly artistic fashion). Read on to find out how much our solar panels cost, how many kilowatts they produce and all of the other details for our solar system. Obviously, our solar array and its associated dollars and cents are specific to the Ontario microFIT program. I expect some of our numbers will translate, though, for others who are setting up their own systems. The last outstanding part of our solar project is to receive our first payment from the hydro company. I have to say I’m looking forward to moving on to the payback stage of this project. This week, I’m sharing all of the details on our solar panel project. For the first post, click here. When we last left off, we finally had an approved application, and we’d made it through a wicked winter. But we were running out of time to complete our panels by the end of our contract. The first step to get ready for the install was an engineering assessment. We had to make sure that the barn was strong enough to hold the weight of the solar panels. 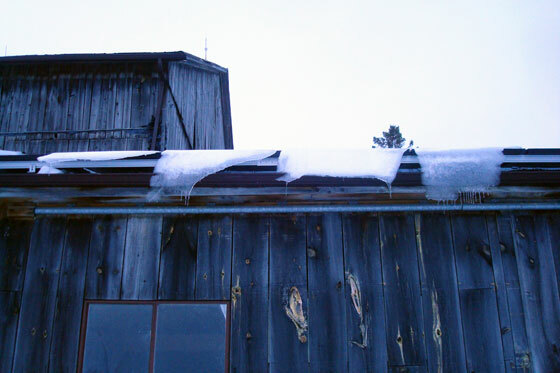 Even though the barn is (at best guess) more than a hundred years old, it’s rock solid, so there was no concern there. The actual solar install finally started at the end of March. First step was the inverters. 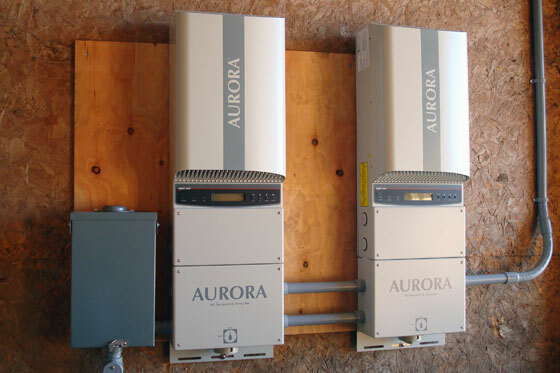 These “convert the DC (Direct Current) power from your panels to AC (Alternating Current) before feeding it back into the hydro grid.” Our contractor’s web site calls the inverters “the brains” of the system. Then came the panels. Solar panels work best if they face south. The sun is strongest and hits them most directly from this direction. Fortunately, the back roof of the barn faces exactly south. Given the long delay in our application process, we had lots of time to observe the barn, calculate sun and shadow patterns and determine the optimum position for our panels. We have a long row of very tall pines along the west side of the barn. They’re so tall that in the late afternoon they cast a shadow on the upper barn roof, so we decided to install the panels on the lower lean-to roof as far away from the pines as possible. Three rows of racks went up on the lean-to, and then came the panels. We have a total of 40 panels, the maximum we’re allowed under the microFIT program. Panel install took about three days. 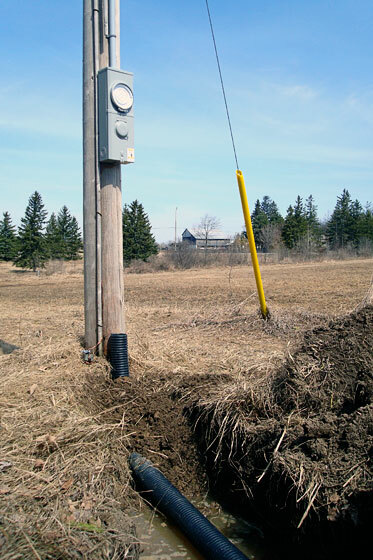 After the last panel was installed, it took another two weeks before the snow had melted enough for the trench to be dug between the barn and the hydro pole. Remember we’re feeding all of the power we generate back into the grid, so connecting into the hydro pole was essential. Of course, it wasn’t simply a matter of waiting for the snow and frost to melt so that the trench could be dug. The trench was more than 300 feet long. Over that distance, we needed a special heavy-duty type of wire, so that we didn’t lose power. Pulling the wire through the trench was another bit of fun. When the trench was dug, the excavator laid a conduit in the bottom. It looks a bit like weeping tile. There’s a rope running through the pipe. The trench is back-filled and the conduit is completely buried. To get the wire from the panels to the pole, our contractor had to pull it using the rope in the conduit–a heavy, 3-person job. April 23 was connection day. Inspections had to happen. Power had to be shut off. Wires had to be hooked up. And everything had to be turned back on again. There were two or three different groups involved, along with our contractor. This was another instance where I was very glad for professional help. I would not have wanted to coordinate everyone. But it turned out all of the scheduling didn’t matter. Connection was a no-go. 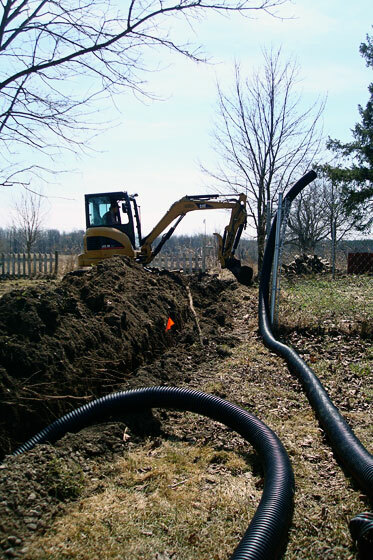 The hydro inspector wanted to see the wire and conduit laying in the trench, but the trench was back-filled. The excavator had installed a T with a small section of conduit that looked down to the bottom of the trench and the wire, but that wasn’t enough. A section of the trench had to be dug out down to the wire so that the inspector could see it. Fortunately, the trench was re-excavated April 23, and by April 24 we were connected. April 25, our contractor came out and walked us through all of the equipment and how it worked. He flipped the breakers and we were live. In the infamous words of Snap, I’ve got the power! This post has been a long time coming. I don’t know why it’s taken me so long to write this, but it’s finally here. Everything you wanted to know (and more) about our solar system. … I mean, our solar panel system… the one on the barn… not the one in the sky. In fact, now that I’ve started writing, I have so much to say that I’m breaking it up into several posts. In today’s post, we start at the very beginning. Under this program, we enter into a 20-year contract with the government. We produce and deliver electricity to the province’s grid, and we’re paid a guaranteed rate per kilowatt for the term of our contract. So we’re not “off the grid.” All of the power we generate goes directly back to the grid. We still buy the electricity that powers our house from the grid. This might seem weird to people. I’ll go into the numbers more later this week, but here’s the basic explanation: the government is paying us $0.396 cents per kW for what we generate. We’re paying the government $0.075 cents per kW (off-peak) for what we consume. Once we made the decision that we wanted to go solar, we started meeting with contractors. Given how the microFIT program works in Ontario, lots of companies are full-service when it comes to solar installs. They take care of all of the applications to the government, they install the system, they monitor your system, they fill out all the paperwork along the way, they arrange for all of the inspections, they even help you apply for financing if you need it. 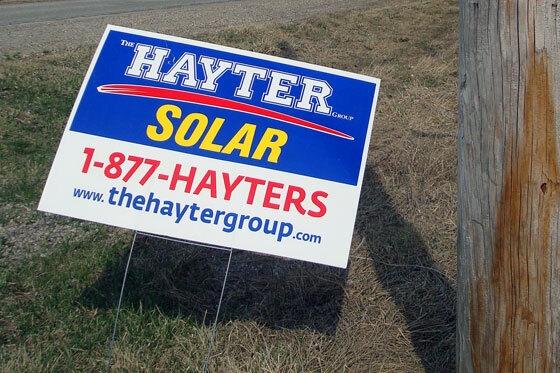 We found companies to contact through road side signs (there are lots of solar installations in our area). The company that we chose is called Hayter. Hayter had great service, had been around for a long time, offered a decent price, and the people we met with were very knowledgeable and down to earth. This was not a quick project. We met with Hayter for the first time in July 2013, liked them and decided to go with them. They submitted our application to the government. Our application was rejected about three times due to minor clerical errors. The microFIT forms are very complicated and missing even the smallest check box causes your whole application to be thrown out. We were very glad to have an experienced company working with us and taking care of all of the paperwork. I cannot imagine having to figure that out on my own. Finally, our application went through. But that wasn’t the end of the bad news. In September, the government suspended the program. They were going to re-evaluate the rate that they paid per kW. When the microFIT program first started, the government paid about $0.80 per kW. When we applied, the rate was $0.55. The suspension meant that our application was dead, again. After re-evaluation in September, the new rate was $0.396. The decrease was very disappointing for us, but we decided to proceed anyways. We’d still be earning more for what we generated than we were spending on buying electricity from the grid. We resubmitted our application. By mid-October, we got the good news that we were in. October 31, we made our first payment to our contractor, and they paid all of the fees with the government. And then came five months of nothing. Our solar company had said that they could work through the winter and complete our install before spring. However, the winter of 2013-14 wasn’t a normal winter. Between polar vortexes, ice storms and snow, nothing could happen. Under the terms of our agreement with the government, we had six months to complete our install. That gave us until April 30. As spring slowly rolled around, we anxiously waited for work to begin. Ooooh. Such a cliff hanger ending. Tune in next time to find out if installation begins and whether we meet the deadline. If you have any questions, please feel free to ask in the comments, and I’ll do my best to answer them in upcoming posts. It’s the last post of April, so time to report on my accomplishments for the month. My plans for April consisted of a few leftovers from March and a theme of “green.” So how’d I do? I just can’t seem to motivate myself to complete the last few details for prettying up my work office. But my home office is getting much more organized and looking much prettier. I didn’t spend any money on the house (I had purchased all of the supplies for my office projects long ago). In fact, I didn’t spend much money at all… aside from a completely unnecessary parking ticket. Country girl goes to the city and forgets the side of the street you can park on depends on whether you’re in the first or second half of the month… argh. We spent a whole lot of green on the solar panels. As much as it hurt to write the massive cheque, we were very happy that we were able to pay for them in full without borrowing any money. The solar panels are obviously about as green as we can get. Our hook-up was delayed by one day, but on Friday the inspector cleared us, and we were connected to the grid. For my office projects, I was able to reuse some supplies I already had like spray paint, fabric and the boxes I made into dividers. At the start of the month, I said that I’d like to get a few quotes to see if it’s possible to get some help to clear the brush from the east shore of the pond. I’m not going to be hiring any help until our bank account recovers from the solar payment, so I’m back to DIYing it. Anyone have a bush hog I can borrow? On the DIY front, two gardens have been weeded. Two more gardens have been de-edged of stones. Some of the grass has been raked. Brush has been cleared off of about half the vegetable garden area. And our free trees have been planted. When I set my goals for April, I said that I was giving myself a bit of a break. Last Saturday afternoon, I actually crawled into bed and took a nap–unheard of for me. Even though I gave myself permission to take it a bit easier this month, I still feel I did a lot in April. What did you do in April? Who else is getting organized? Going green? Saving money? We have a very long, very expensive wire running from the solar panels on the barn, into the inverters affixed to the wall, through metres of conduit, along the 300+ foot trench and up into the box on the pole. 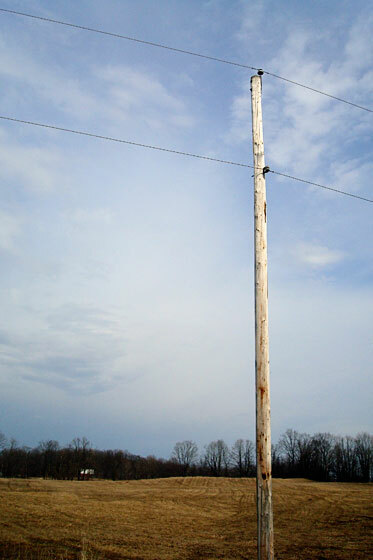 Today is the day our feed makes it to the top of the pole, into the power lines and back into the grid. That is, as long as everyone shows up when they’re supposed to, the work passes all of the inspections and the right wires get plugged into the right spots. Keep your fingers crossed for us. Tomorrow when the sun comes up, we should finally be generating electricity. (And yes, I will do a post with all of the details on our solar project once we’re up and running). What exciting happenings do you have going on this Wednesday? Update: Connection was a no-go. The hydro inspector wanted to see the wire and conduit laying in the trench, but the trench was back-filled. The excavator is back sitting in the driveway and the trench has been dug out. We have a conditional pass, but we can’t connect until he inspects the trench. We’re still crossing our fingers.